A half-melted snowman greets visitors to the home of Kevin and Susan Mayes. Built by their 12 year-old son Ben and his 3 year-old brother Jase, it symbolizes the joy that a toddler experiences after the first large snowfall of the year, and the love of an older brother. While a snowman may only last a few days, family is forever. Back Row: Susan, Allie, Gabe, Kevin and Jase. Front Row: Foster Baby & Ben. Married for 19 years, Kevin and Susan have three biological children: Gabe, 17, Allie 14, and Ben. Jase joined their family as a foster placement at just 4 weeks old, and has been a part of their family ever since, adopted in 2015. Earlier this year, their family grew even more when they accepted a foster placement of an infant girl. On the surface, nothing stands out about Kevin and Susan to identify them as amazing foster parents. 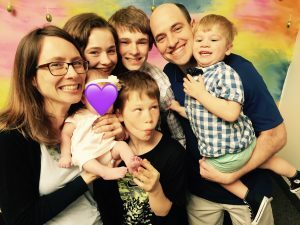 A teacher at MacDonald Middle School in East Lansing and basketball coach at East Lansing High School, Kevin spends his available free time as a husband and father. 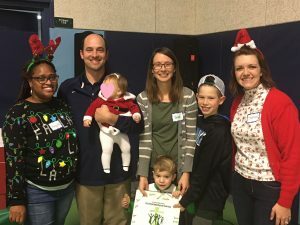 Together, he and Susan care for their children, shuttling their three teenaged children across town in between changing diapers and filling bottles. So what is it that makes this family worthy of the 2017 Chris Ball Outstanding Foster Parent Award from St. Vincent Catholic Charities? That answer is simple: they’re not perfect and they know it. Generosity and faith started Kevin and Susan as foster parents. In 2012 one of the teens Kevin coached became homeless just before winter break. Around the same time, foster parents spoke at their church as part of Orphan Sunday and the message grew louder. “Whether it was conversations with other people who we learned were foster parents, noticing St. Vincent’s and DHHS billboards, songs on the radio, God just kept poking and prodding at us,” Susan said. More than just coincidence, Kevin and Susan have felt a calling from God to take on this ministry. Yet the help and support from STVCC extended far beyond the licensing process. As the weeks turned into months, Kevin and Susan began to feel more comfortable in their new roles and how to approach this form of parenting. “You just have no idea what the next day is going to be and because of that, you just literally live in that 24 hour period,” Susan said. After several months, the uncertainty of Jase’s placement started to become clearer. When the termination of rights became a possibility, Susan was approached about the option of adoption. 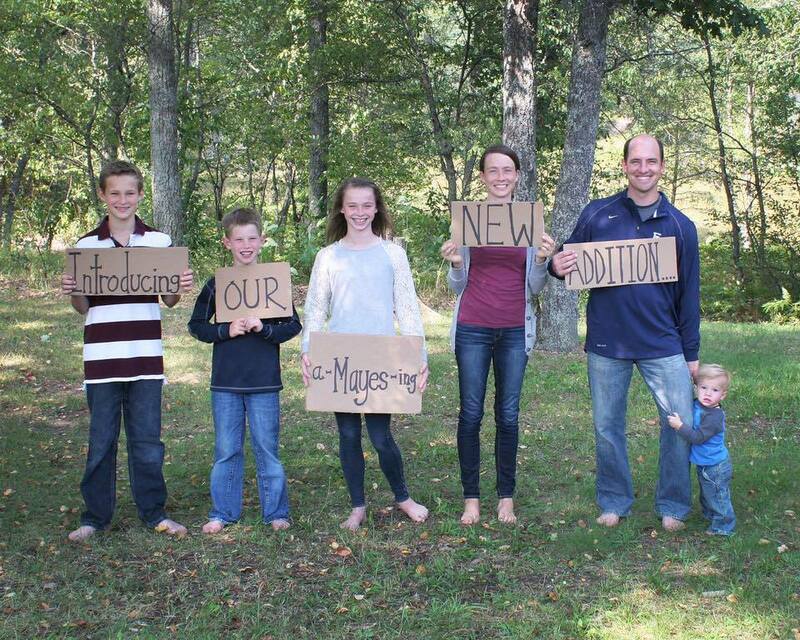 It was a forgone conclusion to Susan and Kevin that they would make Jase an official member of the Mayes family. Kevin even began to think of Jase’s future with them. At times overlooked by those outside of the child welfare system, the goal of each foster care placement is family reunification with the birth parent(s). This is one particular area where Susan has shined and displayed unconditional love. At the beginning, many birth parents experience feelings of resentment and animosity towards those looking after their children. Susan tries to comfort them and relieve their worries as much as possible.